Phil, that's what I meant too. Thank you, Phil. That's what I thought, but going to the pre-recorded testimony made me question it. @me: the governorship has to be occupied by someone and I can't think of a better candidate than Brachler at this time. @Tammy G I got that quote directly from The Denver Post. Donald Trump said he wasn't going to run for president too and look at him. You CAN'T trust politicians, ever. I honestly thought the defense would have the family/friends testimony to show the defendant's childhood, teen years, college years and then call at least one mental health professional to discuss the defendant's descent and leave the jury with that thought. Silva says about the defendant "he just seemed very shy, intimidated"... also described him as "very intellectual"
You can't change laws in this chat room. Just sayin! @Cindy L The millions of people opposed to the DP disagree. Brachler is a blood thirsty supporter of the DP. @ Proph You and all that are personally impacted are changed forever. Unexpected events can propel wisdom even for the very young. Find peace in keeping the spirit alive, as it bypasses the time of all events in life. Much love dear one. @LG I don't recall asking the question, but if I did, I apologize. Anyone else notice that Mr. Holmes and JH have on the same color shirt and slacks today?!? Just catching up with the chat. So so so sorry Proph and BluesB - blessings to you! Cutest baby ever jward12! Congratulations! Yesterday the DT said they had 2 hours of video testimony, so do we have about an hour left??? @ Phil -- on the "Inside the Theater" diagram, it shows Carey and Pierce in two places - row 14 & 15. Is this a mistake? You know what would go well with that great tie and shirt, Phil? Zucchini! Haha. There never was a real plea offer by defense for LWOP, just a common ploy of putting that into a public filing to make the prosecutor look bad. And it worked, as nearly everyone thinks Brauchler turned down a plea offer by the defense, when the defense never negotiated or tendered a plea offer in fact. Sophia, that is what I had heard also. @ Sophia - I didn't know that - where did you get that info. I had thought that AC didn't take the plea due to the victims and victims families request. Another question : in the last 10 years how many times was the death penalty asked for in Colorado ? Colorado Gov. John Hickenlooper signed a "temporary reprieve" in 2013, Dunlap's 1996 death sentence still has not been carried out. Again, thank you everyone. These times are difficult to get through. I'm sure defense, prosecution, Jury, Judge--- everyone-- is having a hard time with this trial. I can only hope this will be over soon so we don't have to keep reliving that day and the following months every time we turn on the television. Are we going to hear anything more from James, or were the psychiatrist tapes all? I haven't watched the entirety of the trial but I was expecting to hear more about the shift in his mental health that lead to this event. So far he seems to have lead a normal life with a supportive family, being more intellectual and introverted, which is also normal. Brauchler is passionate about the case for the victims of the case. To say it's only for his political ambitions is beyond untrue! From what has been said on this site, his wife has pictures of him sleeping on the floor of their living room surrounded by victims case files and evidence. If there is ever a case that calls for the DP, it's the one where the defendant killed 12 people, injured 70 people and intended to kill all 400 in a theater. That isn't a blood hungry prosecutor, that is the victim's families and much of the state of Colorado. Stop attacking a man for doing the job he has given an oath to do. @ Phil - can you confirm about Sophia's comment? There never was a real plea offer by defense for LWOP, just a common ploy of putting that into a public filing to make the prosecutor look bad. 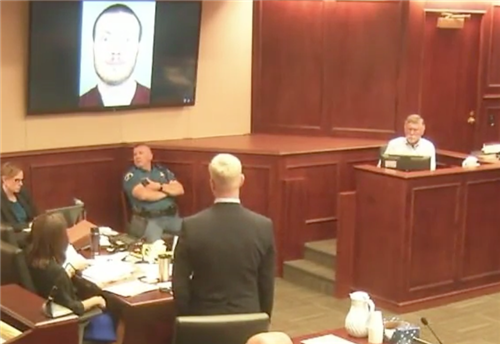 I wonder why the coverage of the trial is solely from one fixed camera in a corner that never moves? You would think tv networks would get better ratings etc if they could actually zoom in and focus on the witnesses, defendant, attorneys etc. is this something the judge is only allowing?